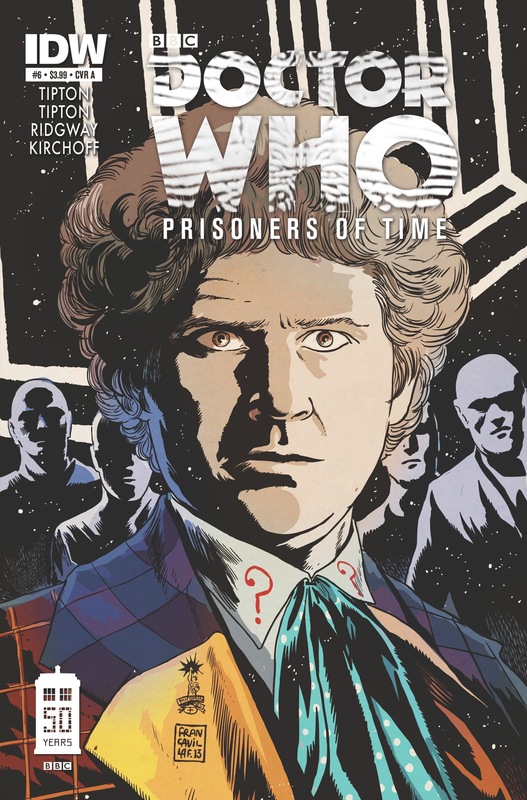 I’ve avoided discussing IDW’s Doctor Who: Prisoners of Time for a while now because I felt it wasn’t progressing in any meaningful way. Looking back at the brief comments I’d made regarding everything beyond the first issue in my weekly pull list posts, I was afraid my criticism would have become redundant. 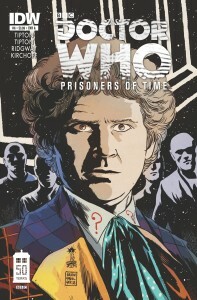 Each issue has provided a fun new adventure for each of the Doctor’s first six incarnations, but they have essentially been isolated tales of a particular Doctor and his companions with little connective tissue to hold the issues together.That all changes with the arrival of issue #6 in comic shops this week, and my interest and excitement for the series has been renewed. From the outset, writers Scott and David Tipton have been giving us glimpses of a shadowy figure hunting the Doctor across his timeline. Beyond issue #1, this has only amounted to one or two pages or panels per issue and most of the issues have been dedicated to seemingly unrelated adventures of the Doctor’s former selves. With 11 Doctors and 12 issues in the series, continuing the single issue treatment of each one without more threads pulling things together seemed like a bleak prospect. I like seeing the old faces, but I don’t want this to wind up as only two issues of multi-Doctor team up. 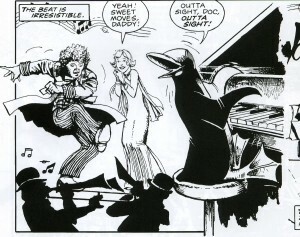 All we really know is that the villain’s endgame involves kidnapping the Doctor’s companions, and a surprising companion traveling with the 6th Doctor may be the central figure of the series going forward, Frobisher the shape-shifting penguin. Each issue of the series has featured a back up piece celebrating the history of Doctor Who in comic form, and Frobisher is a companion that has essentially only appeared in the Doctor Who comic strips found in Doctor Who Magazine during the 1980s. I don’t regularly follow the adventures of The Doctor in other media, but I do have a fond (albeit vague) recollection of this strange creature traveling with the Doctor from my years following the magazine. 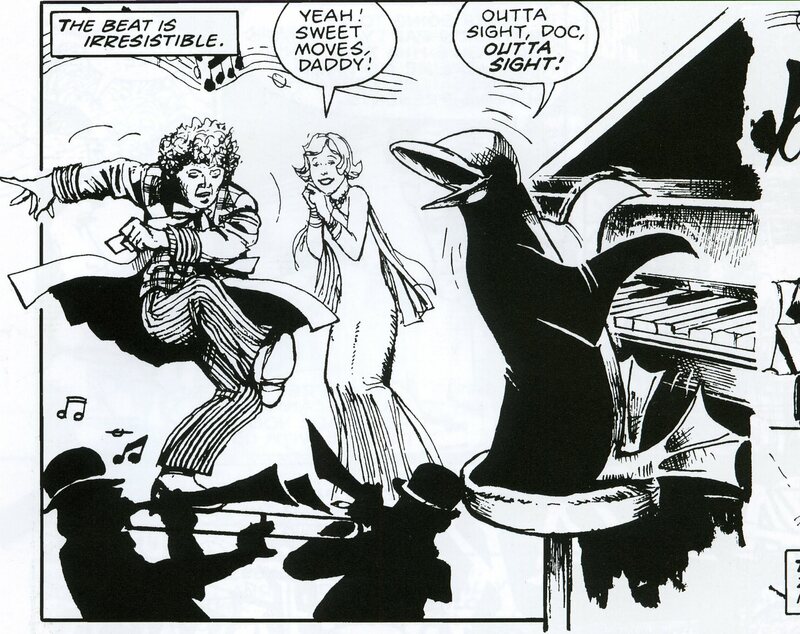 Bringing Frobisher into the mix is incredibly fitting for the 50th Anniversary comic book celebration of the Doctor that Prisoners of Time is meant to be. The issue is very effective at introducing readers to this character they may not have encountered before, and leaves us with him loose in the villain’s inner sanctum somewhere in time. It’s a development and a character that took me by surprise and I can’t wait to see what comes next. With these developments, the series may even provide something more intriguing than a multi-Doctor team up by the time it ends: a multi-companion team up without their respective Doctors. John Ridgway provides the art for this issue and is the latest name in a rotating list of artists working on each installment along with colorist Charlie Kirchoff, who has been a regular on the creative team since issue #3. Ridgway’s art fits nicely with the previous installments of the series and has a grittiness that grounds the characters and the action. It’s an appropriate style for a comic book based on a TV show, and where Ridgway really shines here is his ability to seamlessly depict a futuristic amusement park, an asylum complete with the Doctor in a straight jacket, and Antarctica (granted it’s actually a nature preserve in Antarctopolis, but my fascination with all things Antarctic is well documented). Even though the promise of a multi-Doctor team up makes this series an automatic buy for me, I’m happy to say that I’m back on board with the promise of Prisoners of Time with issue #6. As the actors age and pass away, Doctor Who comics provide a unique opportunity to revisit characters that are like old friends. If you’re a fan of the Doctor’s television adventures, particularly the classic series, this is a great distraction to fill the time as you wait for the 50th Anniversary Special in November. Collected editions are shipping from IDW every four issues for those willing to wait. There will be no waiting for me.